Today the sun, Earth and Jupiter form a 90-degree angle. Astronomers say that Jupiter is at eastern quadrature, 90 degrees east of the sun, at this juncture. Geometric markers such as these, for planets and moons in our solar system, are more than just academic. They indicate where you can find these bodies in our sky and serve as hallmarks in our monthly or yearly observations of neighboring worlds. For example, when the moon is at eastern quadrature, or 90 degrees east of the sun, it’s means that the moon is at the first quarter phase. At such times, the moon is at its highest in the sky at about 6 p.m. local time. 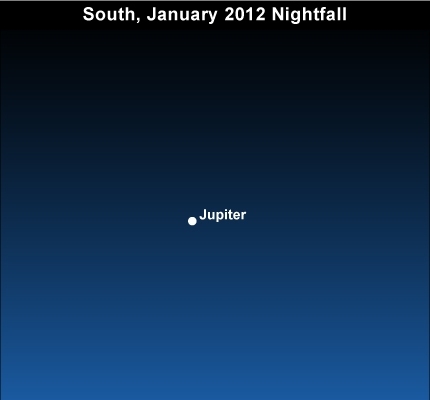 And so it is with Jupiter tonight. This bright planet is now approximately highest in the sky at 6 p.m.. You can easily spot Jupiter because it is the second-brightest star-like object in the sky, after the planet Venus.